Topics: Accueil, Nettoyage, Coloration, & Procédure. 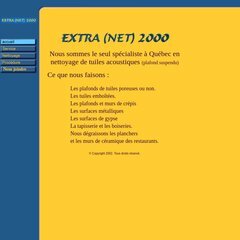 extranet2000.ca Extra (Net) 2000, la compagnie de nettoyage pour tuile acoustique .. It is hosted by Acenet Inc (Michigan, Southfield,) using Apache web server. Its IP Number is 68.171.220.194. It has 2 DNS records, ns2.simaquebec.com, & ns1.simaquebec.com. PING (68.171.220.194) 56(84) bytes of data. A time of 19.9 ms, is recorded in a ping test.